Being a realist, I have trouble finding subjects that have not been brought to a canvas before. I may have done it once, when I did a portrait of Jordan working on a laptop computer. 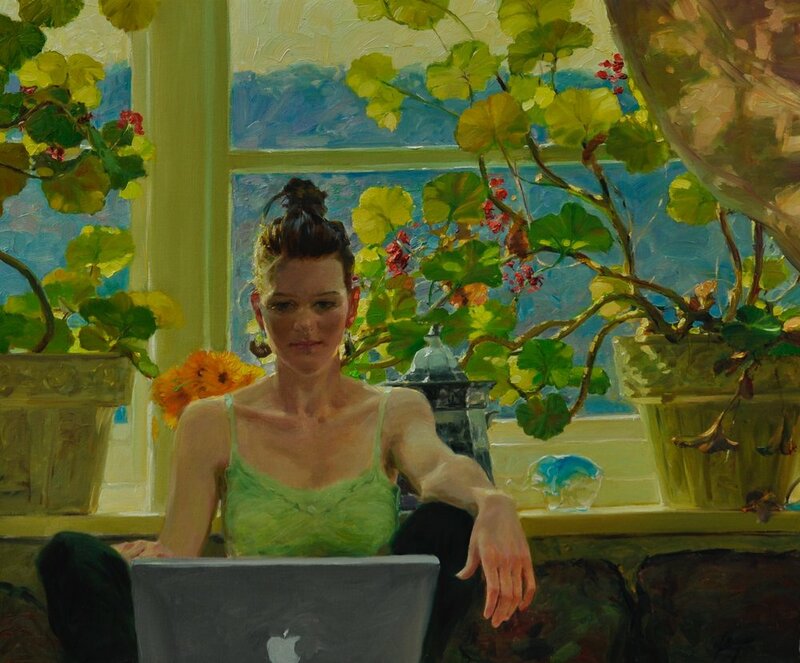 I have yet to see a painting with a laptop done before I did mine. How many artist out there look for things that haven't been portrayed before? For me, looking for such things has always occupied my mind. I settle, these days, for what I put together in a painting. My window series is a way for me to mix still-life setups with landscapes. White daisies against a dark stormy sky is one of my latest. I collect photos of skies and other things that one finds in the landscape. Painting the still-life, direct from life, I may add a landscape from a photo or from a plein air painting. Trying new combinations keeps painting interesting. A quiet evening is what I enjoy most these days. Watching Henry breathing, dreaming of catching a rabbit or a squirrel. Henry is my dog who just hates going out to do his business. “Too damn cold,” his eyes tell me. Invariably he will catch his lead on a chunk of ice and I'll have to go out and get him free. If I do not tie him on, he'll wander off. I dream of Spring theses days and Spring colors. I doze off and miss the ending of a two hour mystery. Henry looks up at me, he needs a scratching and a treat before settling in for the night in his doggy bed. Takes him a good ten minutes to get his blanket just so. When he is finished and settles in, the blanket it is pretty much as it was when he first began scratch at it and pushing it around with his snout. He stares at me. The message?Go to bed so he can sleep. At 3:00 AM he'll tug at my blanket wanting to go out again. Henry has made it into several of my paintings, laying on Jordan's lap or staring at Kim reading. In his own way he inspires me. The moon at 3:00 AM is quite beautiful, even when it's 20 below zero out and Henry still hasn't found the perfect spot for his gift to nature. Back in my warm bed I dream about painting a night scene with a bright pale moon shining through my neighbor's tree. Inspiration is always there for artist if they are willing to look.